From the outset, sustainable development is at the heart of our concerns. At every product design, we challenge the way we manage energy and continually improve our controllers solutions to reduce energy bills while maintaining the comfort that the user is entitled to demand. For some years now, we integrate innovative features into our products such as the energy consumption indication, the occupancy detection, the automatic programming with self-learning process, the open window detection... allowed us to use energy more wisely in order to improve its consumption by ensuring more comfort and less energy expenditure. Thanks to this eco-design approach, it is therefore natural that we have been able to anticipate the Ecodesign directive. Effective the 1st January 2018, this new Ecodesign Directive is mandatory and defines the ecodesign requirements. European Union regulation 2015/1188 / EU, associated with the ERP directive 2009/125 / EC define the minimum requirements for products with a high energy demand. The goal is to reduce energy demand and CO2 emissions, as well as increase the total share of renewable energy. These directives apply to all products put into circulation in the European Economic Area (EEA). All decentralized heating devices (individual heating devices) will be impacted. The products concerned will have to integrate this new regulation. Well aware of the constant need to improve energy efficiency in housing, We had already invested almost 10 years ago to develop and master these innovative features, which were gradually introduced into our controllers. For electric radiators, Ecodesign controllers were therefore available in our ranges, so we decided to invest in extending our innovations to the bathroom, offering you one of the widest ranges on the market! 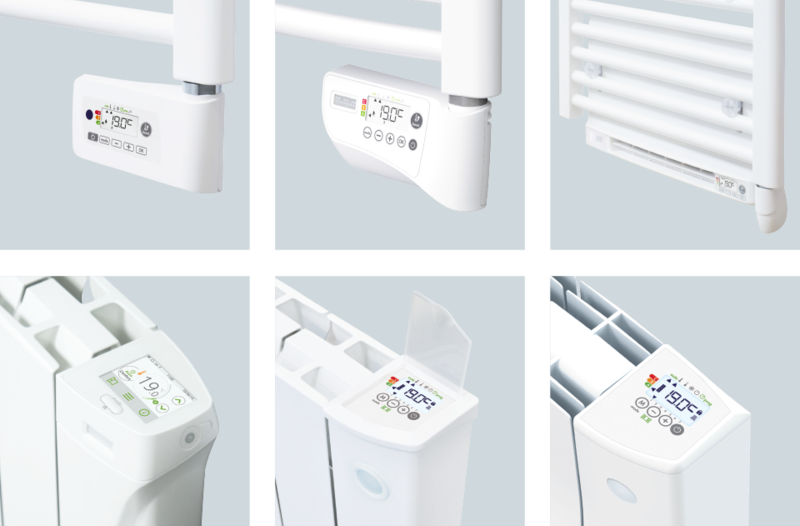 We have therefore added a range of controllers for electric towel rails, as well as a complete range of ultra-slim hot air blowers, in standard or custom style, remotely-controlled. Discover our innovative controllers solutions combining ergonomics, style, connectivity and performance! Particularly neat styles, disruptive, to differentiate yourself, patent and model protections, a single, intuitive and ergonomic interface for all products. Our only purpose: your customers’ satisfaction. We want to contribute actively to the growth of your market share by always offering more comfort and savings for the end user.